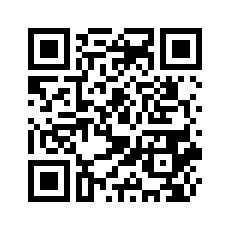 My new application Emu48 for Android has been released on the Google Play store. It is an Android port of the famous Emu48 for Windows. Add infer XSD from XML menu. Fix a null reference exception in the documentation (Thanks Mario M.). Add the namespace in the command line option -r (Thanks Kevin). Add the option --no-gui to prevent the UI to be shown (Thanks Kevin). Fix the URL escaping in the import (https://github.com/dgis/xsddiagram/issues/11). Add the attributes of an element with the option -a for text output only. Fix bad case sensitivity to reference the elements (https://github.com/dgis/xsddiagram/issues/15). The error dialog should now appear if a local dependency cannot be loaded. Fix the "use" field of an attribute with a reference (Thanks Christelle S.). I increase the minimum width of an element when showing the documentation for an easier reading (Thanks Stefan B.). Add the documentation in the diagram. Add a close entry in the File menu. Add a recently opened list. Add the selection of an element in the diagram and allow to move from one element to another with the arrow key. Show the Windows Explorer registration menu only if we have the adminitrative right. Disable the impossible actions in the menu and the toolbar when XSD file are not loaded. Allow the specification of a complex type in the command line as a root (-r element1 -r complexType2 -r ...). And a lot of bugs fixed. Add CSV and TXT output rendering following the Christian's idea. Log errors in the standard error console (when launched via command line). Set the culture to invariant (prevent comma in floating numbers). Fix a typo with "Attributes". 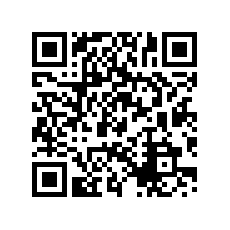 My new application Paint by Numbers for Android has been released on the Google Play store. Add iOS 7 interface. Change the colors to the default to be compatible with iOS 6. 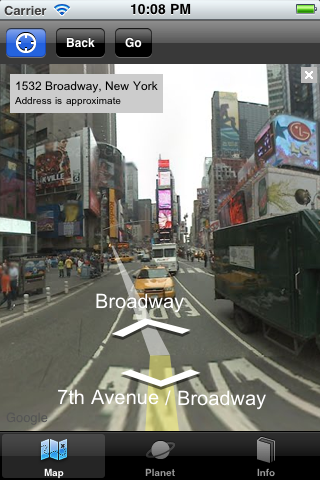 Fix the Street View blue overlay. Fix the offroad black small planets (in a building for instance). 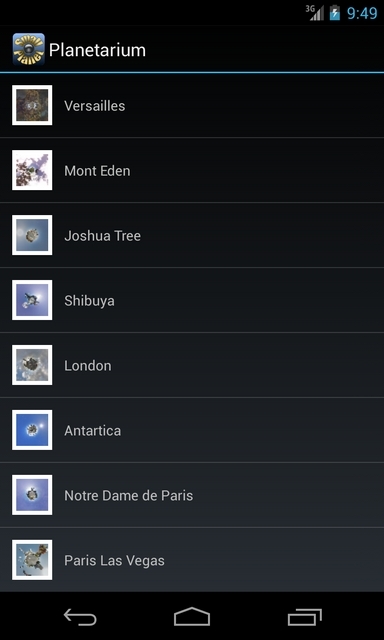 Small Planet is available for Android devices version 4.0 or later. Generate a small-planet from where you are and send it as a postcard to your friends! 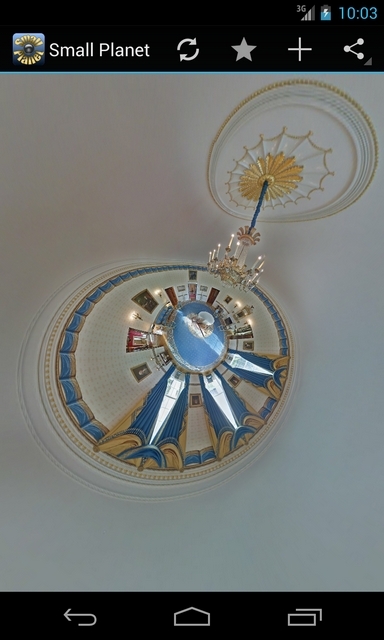 This application makes a stereographic projection of your location on the map where Street View is available. 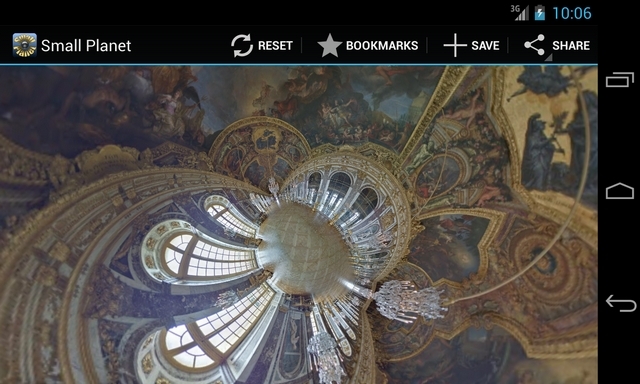 It is also possible to project one photograph coming from the camera roll. Slide your finger on the screen, and then you can continuously move from a bird's eye view in the sky (mini-planet) to an insect view at ground level! Fix an issue to prevent the cylcles in the imported files. Add a dialog to download a xsd file with its URL. Add Ctrl+0 to reset the zoom. Add the option to slice a rectangular cake. Add the compatibility with the iPhone 5. Add search field on the map (It can be any location name, gps coordinates, or even a Maps link). 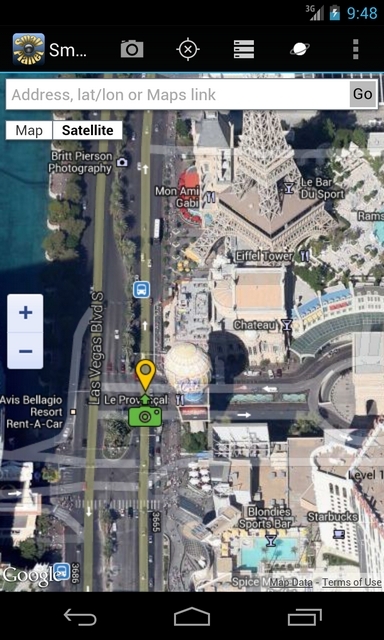 Change the location (GPS) icon with a more modern arrow icon. Improve the planet preview quality on retina screen. Accept all kind of https certificates when the xsd dependencies (import or include) point to a TLS/SSL url. Prompt the user to authenticate when the xsd dependencies (import or include) point toward a secured url. Add the corresponding command line "-u USERNAME" and "-p PASSWORD" options to authenticate the url download. It is now possible to drag'n drop an url pointing to a xsd file on the main window. Improve the error message in case the image is too big to be generated. Some element (complex type derived from a restriction) could cause an exception. These element are now display but can not be expanded. Due to popular interest for CodeTV, I created a Github repository to speed up the development with the community. Don't hesitate to create a fork of this project on Gihub, I will commit your changes in main branch! Remove the "Order" attributes in the source file XmlSchema.cs which are imcompatible with mono > 2.6! Add the option "-y" to force huge image generation without user prompt. Fix some hashtable to dictionary conversion issues due to the previous refactoring. Modify the way the comments are displayed (charset and html characters). Logo and CSS have changed. Add the XSD Diagrams core library under the LGPL/MS-PL license, thanks to Paul's refactoring. Add the XML validation operation using the currently loaded XSD schema in the Tools menu. When the WebBrowser is not available, use a TextBox instead (For Mono without WebBrowser support). 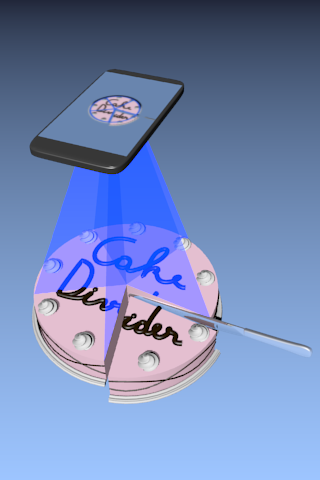 My new application Cake Divider has been released on the App Store. The simple task of cutting a cake fairly is always a challenge when the number of slices is not a multiple of two. This augmented reality application is very simple and draws on the screen a configurable number of slices over an image coming from the camera. 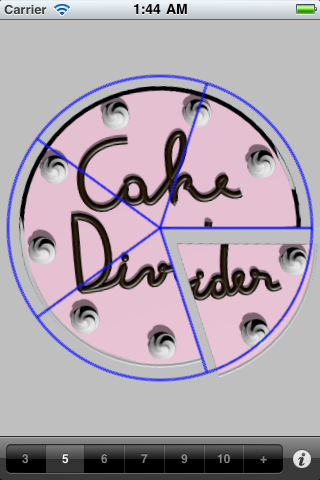 CakeDivider allows you to cut your cake fairly. It works for any kind of round cake, pie or pizza. It is simple and very useful. 1) Choose the number of slices at the bottom of the screen. This causes the screen to draw a sliced disk. 2) Hold your device over your cake. 3) Thanks to the camera, you just have to follow the traces on the screen with your knife and cut your cake perfectly. Allow to expand restriction type (Thanks to Hermann). Fix an unicode issue with infinity character when building xsd diagram on linux. Small Planet version 2.0 has just been release today ! Not free anymore, but the cheaper price allowed by Apple. 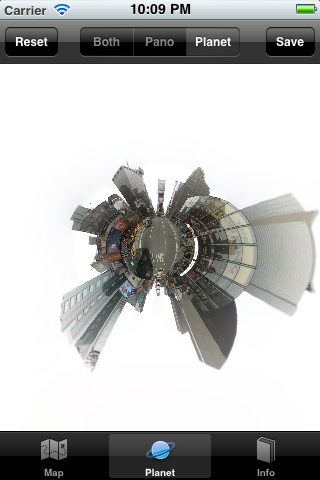 Today, my little funny application Small Planet has been released on the App Store. 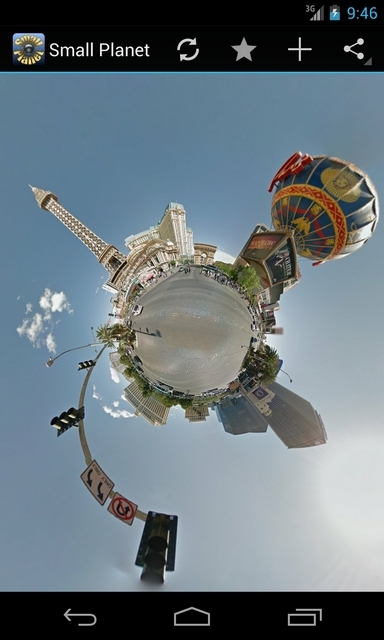 This application makes a stereographic projection of the place you are on the map. Following the Rex's idea and need, I added a complete command line support for the image generation on Windows and on Linux with the Mono-Project. It was a nice surprise to see the "xsddiagram" package in the last Linux distribution Ubuntu 10.10. It should be present in Debian too. Thanks to Mathieu for these packages! Add support for the atom feed with the journals and the comments. When posting a comment, request a human factor (CAPTCHA). The comments are now wrapped. This web site is now RSS/ATOM compliant. So now, you can follow this news page and the comments on the software pages (i.e. XSDDiagram) with your favorite feed reader. Ajout de XSDDiagram version 0.6 !!!! Au menu des changements, le support partiel de Linux avec sa machine virtuelle Mono. Rendez-vous ICI pour la suite des évènements. TMChecker permet de contrôler la présence de joueur sur un serveur TrackMania en réseau local. Dés qu'un joueur est présent, une info bulle apparait sur le bureau de Windows permettant d'un clique de se joindre à la partie en cours. Display ASCII character (> 128) with the default system encoding (Thanks to BlueG). 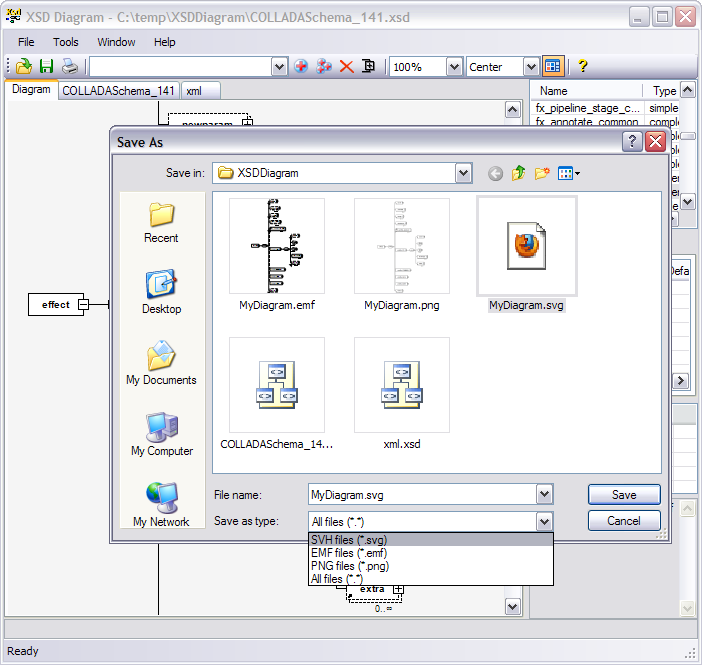 Ajout de FastHexaViewer et de XSDDiagram. Page size about 37638 octets. Server generation in 0.024 seconds. Client load in seconds.